Background: Cytological examination of serous fluids aspirated is a simple and relatively non-invasive technique to diagnose whether the effusion is malignant or benign. Cell block preparation along with conventional smear increases the sensitivity of detecting malignancies, and also has the ability to reduce false-positive interpretations. 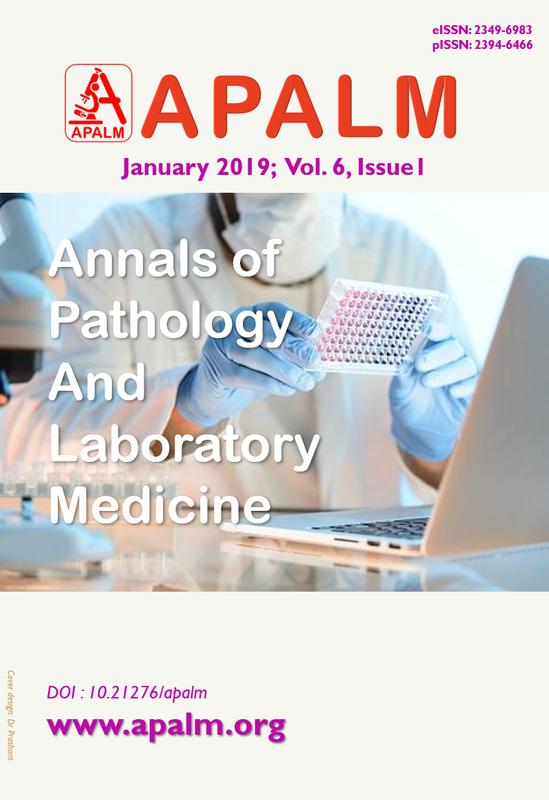 Methods: A total 68 samples of body fluid (pleural and ascitic) specimens were examined for conventional cytological smear (CS) and cell block method (CB) over a period of one year. Out of 68 fluids, 40 were pleural fluid and 28 were ascitic fluid. Each fluid specimen was examined by conventional smear technique as well as cell block technique. The morphological details, cellularity, architecture, nuclear and cytoplasmic details were studied in both CS and CB techniques. Result: A total 82.35% smears had adequate material; while of the total cell blocks, 75% cell blocks had adequate material. A total of 11.76% cases were malignant on smears,5.88% were suspicious of malignancy, 64.7% were benign/non-neoplastic lesions. A total 13.2% cases were malignant on cell block, 1.47% were suspicious of malignancy, 60.29% were benign/non-neoplastic lesions. Sensitivity, positive and negative predictive value and accuracy of cell block technique were greater than that of FNAC smears Conclusion: For the final cytodiagnosis of body fluid, there is statistically significant difference between the two techniques. Cell blocks prepared from the residual fluid specimen can be useful for more definitive diagnosis, with advantage of IHC and special stains where required. 1. Koss LG, Melamed MR. Diagnostic Cytology in Koss’ Diagnostic Cytology and its Histopathologic bases. 5th ed. Philadelphia, Pennsylvania, USA: Lippincott Company, Vol.I : 2006:3-18.
smear examination in effusions. J Cytol. 2009;26:60. 3. Nathan A Nithyananda, Narayan Eddie, Smith M Mary, Horn J Murray. Cell Block Cytology Improved Preparation and Its Efficiency in Diagnostic Cytology. Am J Clin Pathol 2000;114:599-606. 4. Bales CE. Cytological techniques, part1. In: Koss LG, ed.Diagnostic Cytology and Its Histopathologic Bases, 5th ed. Philadelphia,Pennsylvania, USA: Lippincott Company, Vol.II 2006:1590-1592.
cytology. J Cytol. 2012 Jan-Mar; 29(1): 11–15. embedded cell blocks from fine needle aspirates, effusions and brushings. ActaCytol. 9. Leung SW, Bedard YC. Methods in pathology: simple miniblock technique for cytology. Mod Pathol. 1993;6:630-632. 10. Frederick M, Bridget C, Ann D. A review of 50 consecutive cytology cell block preparations in a large general hospital. J ClinPathol 1997;50:985-990. 11. Spieler P, Gloor F. Identification of types and primary sites of malignant tumors by examination of exfoliated tumor cells in serous fluids. Comparison with diagnostic accuracy on small histologic biopsies. ActaCytol 1985;5:753-767. 12. Brown T Karen, Fulbright K Robert, Avitabile M Ann, Bashist Benjamin. Cytologic Analysis in fine needle aspiration biopsy: Smears vs Cell Blocks. AJR 1993;161:629-631. 13. Sujathan K, Pillai KR, Chandralekha B, Kannan S, Mathew A, Nair MK. Cytodiagnosis of serous effusions : A combined approach to morphological features in Papanicolaou and May –GrunwaldGiemsa stained smears and Modified cell block technique. Journal of Cytology 2000;17(2):89-95. 15. Bodele AK, Parate SN, Wadadekar AA, Bobhate SK, Munshi MM. Diagnostic utility of cell block preparation in reporting of fluid cytology. J. Cytol 2003; 20(3):133-135. 17. Richardson HL, Koss LG, Simon TR. Evaluation of concomitant use of cytological and histological technique in recognition of cancer in exfoliated material from various sources. Cancer. 1955;8:948–950. 18. Liu K, Dodge K, Glassgow BJ, et al. Comparison of smears, cytospin & cell block preparation in diagnostic & cost effectiveness. Diagn cytopathol. 1998;19(1):70–74.